The Bundy Ranch showdown reminds me of my own BLM association. I have my own stories about tyranny and injustice. From 2001 to 2008 my work was mostly independent contracting for the government. Including Forest Service and BLM jobs. 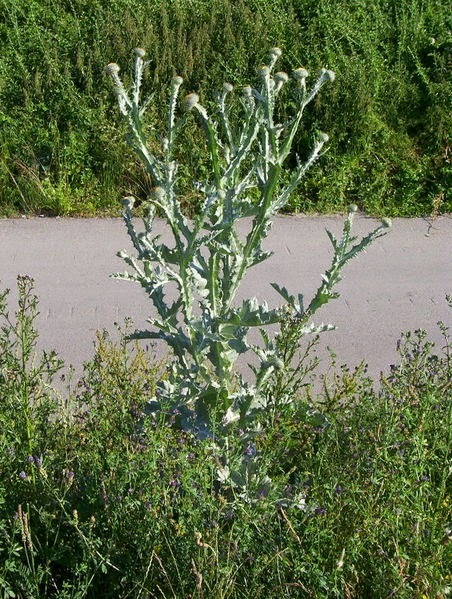 Several years I won a bid for herbicide spraying on public lands to control invasive species like this one, Onopordum acanthium, the Scotch thistle. In 2008 something changed. Introduced in the bid process was a provision they called "SBA 8(a)". After that was implemented I never won another contract. The last big job we won involved weed spraying at the site of the Milford Flats fire, with other fire-damaged areas around Beaver County in southeast Utah. It covered about 90,000 acres of BLM land. We started work in May and worked through the summer and into September. My partner and I worked really hard, and the BLM supervisor from Beaver indicated that he was pleased with our efforts. Based on our performance, he promised to help get us the contract again the next year. When the next spring arrived we were expecting to have the contract renewed. Instead, we learned that it had been given to another company that was 8(a) qualified. The other company did not participate in bidding. They had no performance history. But they were placed at the head of applicants because of the 8(a) status. The local supervisor had no say in the matter. Apparently this company filed SBA documents that certified that the business was owned by a woman. They were hired on that basis alone. We never won another contract bid. Somehow it never seems to dawn on folks that discriminating in favor of a group is just as wrong as discriminating against a group explicitly. I am sorry to hear of this experience. You have a great blog, by the way. And I enjoy your comments on M*. Mormonchess, thanks for your note. My blogging is mostly motivated by a desire to leave a record of my dealings, but it is always gratifying when somebody else stops by to say a few words. I labor diligently to write, to persuade my children, and also my brethren, to believe in Christ, and to be reconciled to God; for I know that it is by grace that we are saved, after all we can do.